Unsurprisingly, the way that utilities and states use the traditional tests demonstrates that the tests are not always performed consistent with their theoretical definitions – because of statutory requirements for what must be included or excluded, the asymmetrical inclusion of costs without including their associated benefits and similar policy-driven modifications. This means that, due to how the state applies the test, what is called a Total Resource Cost (TRC) test in one state may be a completely different test than the TRC in another state. The traditional tests also may not adequately value factors that the state may consider important such as water impacts or economic development. A group of organizations and individuals known as the National Efficiency Screening Project (NESP) is attempting to create a new framework for cost-effectiveness testing that would help states fully value the costs and benefits that they consider important. NESP published a new manual drawing from decades of experience and the changing needs of jurisdictions that are investing in energy efficiency. This manual, the National Standard Practice Manual (NSPM) provides a framework for assessing the policy goals of a state and aligning cost-effectiveness testing for energy efficiency with those goals, and for accounting for all the relevant costs and benefits. MEEA has previously written about the NSPM here. A new report, published by the Minnesota Department of Commerce and prepared by Synapse Energy Economics, uses the NSPM framework to consider how Minnesota conducts its cost-effectiveness testing. Updating the Energy Efficiency Cost-Effectiveness Framework in Minnesota examines current energy efficiency screening practices in Minnesota along with the state’s policies and goals and uses the NSPM to ‘test the current test’ for the state. The research includes a review of laws, statutes and commission orders along with interviews with and written comments from key stakeholders. What’s Included (and Excluded) in the Minnesota Test? The report concluded that there was clear stakeholder support for including low-income impacts and other fuel impacts, but that participant impacts should not be included because of the lack of a clear policy directive and because of asymmetry in the current practice where participant costs are included but not all corresponding participant benefits. 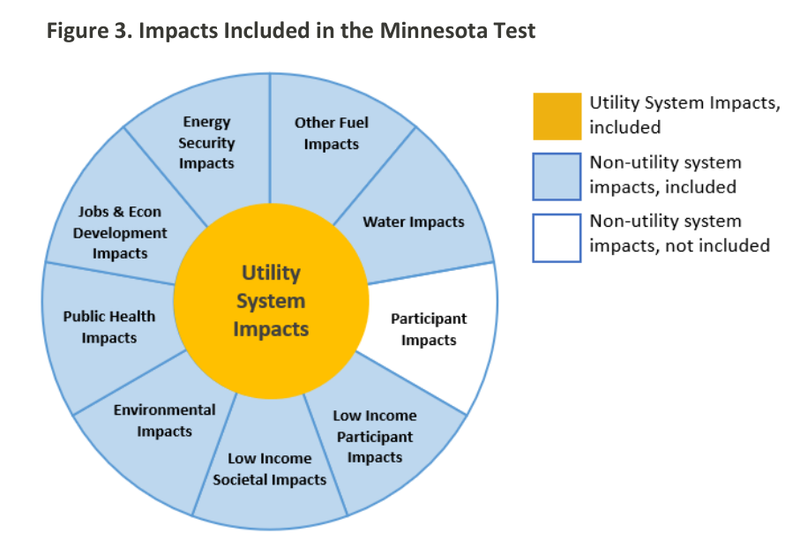 The impacts included in the suggested Minnesota Test are shown in the figure below (courtesy of MN Dept of Commerce & Synapse Energy Economics). The authors recommend that the Minnesota Test be used as the primary test of cost-effectiveness for the state. They further recommend that the other standard cost-effectiveness tests that are currently in use in Minnesota be modified in practice to be consistent with the full costs and benefits that are included in their theoretical definitions. They can then be retained as secondary tests to comply with statutory requirements and provide different perspectives on cost-effectiveness. There are additional areas of research that are suggested, particularly better quantification of impacts such as climate change, wholesale price suppression effects, reduced risk, increased reliability and avoided credit and collection costs – factors that are part of the Minnesota Test as well as the Program Administrator Cost and Societal Cost tests. Should the state decide to follow through with any of the recommendations of the report, it is likely to be through some sort of working group/public stakeholder process. The report was funded by the Department under the Conservation Applied Research and Development (CARD) program, an annual grant program authorized by Next Generation Energy Act of 2007. Take a deep dive on the Minnesota Test with this webinar featuring Adam Zoet from the Minnesota the Department of Commerce and Tim Woolf of Synapse Energy Economics. Panelists will discuss the report behind the Minnesota Test and answer your questions. Watch the recording. For more information on cost-effectiveness testing, please contact Greg Ehrendreich. For information about Minnesota’s EE policies, please contact Sophia Markowska.